It’s stories like these that are true historical treasures of our community. Rarely recorded, they are usually lost when the eyewitnesses to history pass on. 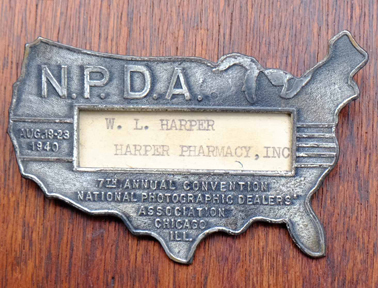 I had been a “soda jerk” and cashier at the drug counter at Harper’s Drugs since I was 12 in 1939. In the fall of 1941, Mr. Harper and his son had a discussion and called me over. Bill Harper said the bandages and adhesive tape boxes really looked “shop worn” and, although still sterile, they were several years old. They asked me if I would put in extra hours and replace everything over a year old. I was enthused; my wages were 15 cents per hour and my savings were growing “slowly”. I stocked the shelves with all fresh merchandise—bandages, tapes, iodine, mercurochrome, Ungentine and all those 1940’s medicine cabinet standards. I boxed up all the replaced items and took them downstairs. On December 7th, Sunday afternoon, my buddies and I gathered at Saratoga Lanes in Maplewood. We were all “part-time” pin setters and our “boss” allowed us to use the pool tables on Sunday. He had the radio on and called us over. (We thought he had found out about our leaving one pin out for the bowling teams that never gave us a tip so they only bowled “splits”!) He turned up the radio and found our lives were forever changed. The Japanese had bombed Pearl Harbor and our country was at war. What could a room of fourteen-year-olds do to help? Eddie Heidbrier said, “We are all Boy Scouts. We have been taught First Aid and are ready. We can help.” I remembered those boxes of bandages, adhesive tape and boxed meds at Harper Drugs. I called Mr. Harper at home and I said, “Our Boy Scouts need these supplies.” (He was pleased to clean them out of the basement!) Warren Couch, Wayne Frisinger, Bobby Garrett, John Hardy and I all trooped down to Harper Drugs and carried all the boxes to Maplewood Baptist Church. (In 1941, nobody’s doors were locked and we took our stock to the church basement.) We found empty shelves and organized our stock. Our Pastor arrived and I told him what we were doing. He laughed and said we were okay. 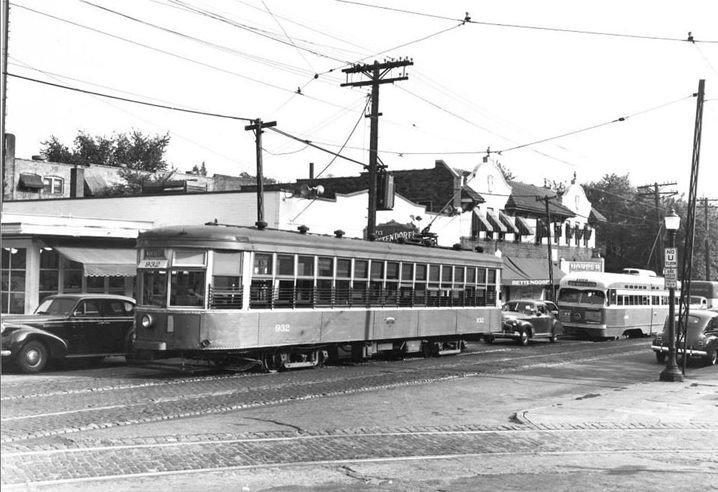 Judging by the cars, the year this image was made may have been the late 1940’s. If I remember correctly this image was found on the Facebook page, Vintage St. Louis. 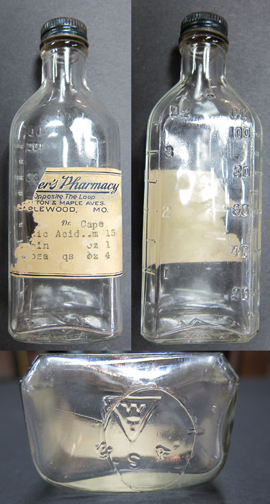 Three views of the same bottle. Courtesy of the Maplewood Public Library. From memory this sign is about three feet long. Courtesy of Martin Fischer. Harper’s in the 1970’s. Courtesy of the Maplewood Public Library. Thank you, Doug, for a story which seems somehow so relevant today. And thank you to Mr. Jones who surely has seen much in his life, and has a broad perspective on things. Sherman…just a note…It is okay with the apostrophe. With the apostrophe in it, it denotes “possessive” …… ie: it belongs to the pharmacy….thus it’s door. It would be wrong without the apostrophe. At least I remember that from English in grade school…. (I think)…lol. (BTW I did NOT put the apostrophe in “its”!! It was the not so smart phone). lol! you are correct on the possessive term. You’ll never hear me complain about an apostrophe missing or otherwise. I favor a creative approach to punctuation, spelling,…well just about everything when I think about it. The last English class I had was in the 1960’s. I didn’t care then and don’t now about the finer points of the craft. So to you folks considering commenting, go right ahead. You don’t have to know a gerund from a participle to participate here. Interesting, Doug. Tell us again when Harper’s Pharmacy finally closed it’s doors. Are any Harper family members still living in Maplewood (or anywhere)? I went to school with Darla Harper, class of 1977. Also wasn’t Onis Harper on the Maplewood City Council for a number of years? I believe that was Darla’s father. 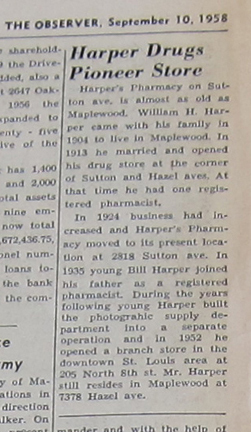 Sherman, when I moved to Maplewood in 1975, Harper’s was no longer a pharmacy. It was a photography store. We actually had two. The other was Vazi’s which was in the old Brownsom Hotel building by the Yale Loop (in the last photo of this post the corner of Vazi’s Photographic Service is visible). I think it must have closed sometime in the early 1980’s but I won’t bet on it. I googled William Harper to hopefully see when Bill Harper passed. Couldn’t find it. William Harper must be right up there with John Smith in popularity. I don’t know if any Harpers still live in Maplewood. I remember Oni as he was called but I never knew him well. I met Alice who was Bill’s sister. she was very kind and allowed me to copy many of her photos. I also met Bill’s daughter, Mary Harper Hall, who was also very generous. She gave our historical society the panoramic photo taken in the middle of Sutton in 1930. It is now in the collection at our library. She and her husband also donated other photos and memorabilia. They live in Michigan. Did you check the Social Security Death Index? There are web sites where you can look for free. It helps if you know some details about him, like year of birth or middle initial. Also, Family Search.org. I did see a William Harper who died in 1977 in Chesterfield 63017.